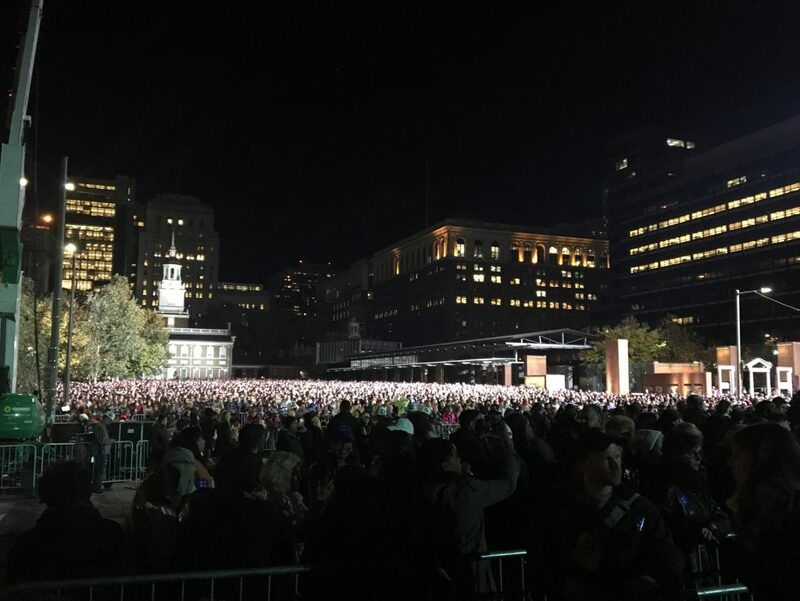 On the eve of election day, thousands of people gathered in Philadelphia for the Get Out The Vote rally on Independence Mall, home to some of the most historic and symbolic sights in the history of American democracy. Steps away from where the Declaration of Independence and Constitution had been signed, where the Liberty Bell is housed, and where Betsy Ross stitched the first American flag, the historical significance of the location heightened the significance of the event. 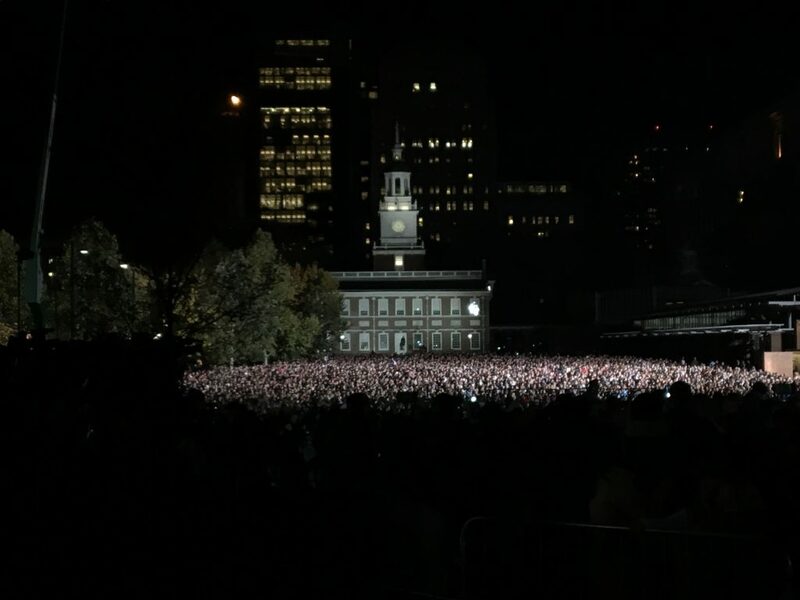 After a tedious wait through a security line that had begun at 10am, the sudden view of a sea of people, with Independence Hall in the background, was breathtaking and humbling. 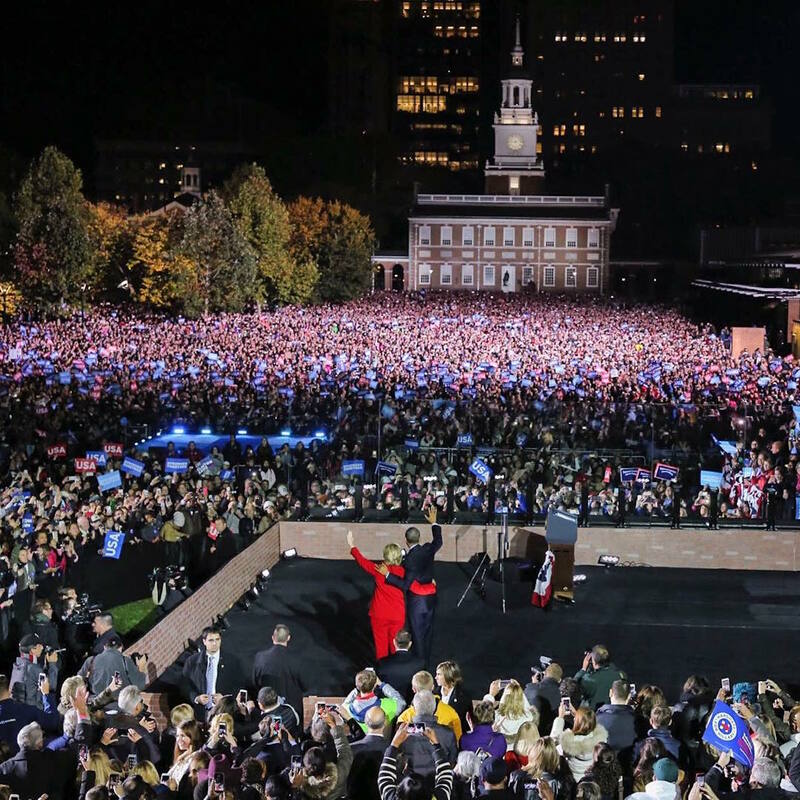 In the stream of last efforts before arguably the most crucial day of 2016, Chelsea Clinton, Bill Clinton, Michele Obama, Barack Obama and Hillary Clinton herself came together in Philadelphia as an epitome of the overwhelming theme of the event: unity. It began with Bon Jovi, who reminded the crowd to take lots of pictures, because they had a front row seat to history. Bruce Springsteen, whose remarks and music were inspiring enough to silence a crowd of thousands of excited people, endorsed Clinton as someone with an actual vision where everyone counts. It was this message of inclusiveness and togetherness that continued to ring most prominently through the rest of the night. The need to unite in effort and shoulder a part of the responsibility on election day was evident in every speaker’s remarks. As we sat on the brink of making history, we were simultaneously surrounded by the evidence of history that had been made. We listened to the first female presidential nominee from a major party address her voters, and we were reminded of all of the firsts that had taken place on these same city blocks. The United States was unprecedented and unusual, and much of what has occurred over its history has been equally unprecedented and unusual. But certain principles have continued to ring true. As Bill Clinton reminded us, our founding fathers wrote about forming a more perfect union, and over 200 years later that union remains, because we’re stronger together. As I watched the entire crowd fall silent when Bruce Springsteen began to play, get riled up after Michelle Obama’s call to action, and emotional (even in the press section) when Barack Obama left the stage, I was reminded of this power of unity – the power to act and feel and experience together. From one faulty document that attempted to bring 13 unruly states together into some sort of unprecedented union, to the gathering of thousands of people of every gender, religion, race and profession, the power of unity has proved itself time and time again over the course of the past 200 years. Michelle Obama reminded us while this election feels ominous and potentially dangerous, it is nonetheless entirely in our hands. We each hold the personal responsibility of voting, but we hold a collective responsibility as well, and the burden of the consequences of our actions is a shared load. 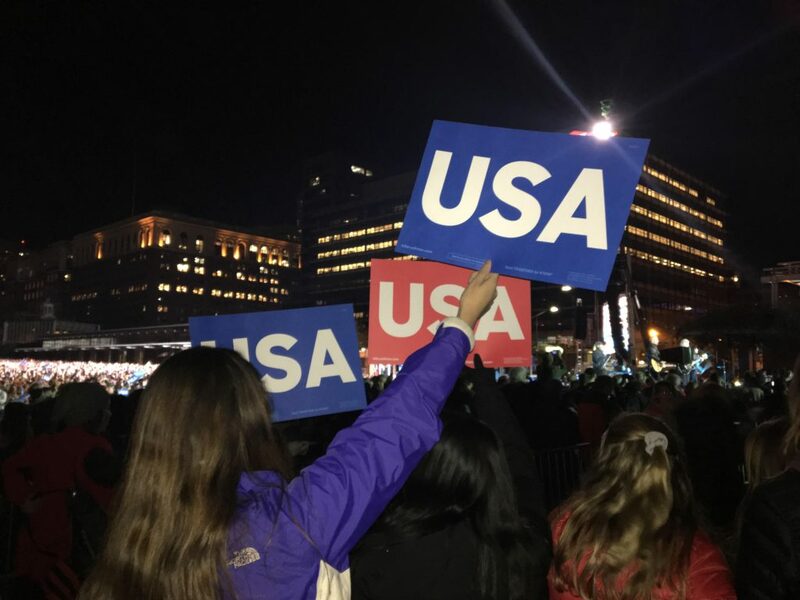 If the gravity of this presidential election was not already apparent, it was practically tangible last night; in less than 12 hours after Bon Jovi took the stage, the polls will have opened. In just over 24 hours after Hillary Clinton finished her address, the polls will have closed, and the election results will have been announced. To see five of the most prominent faces of the Democratic campaign on one stage was a reminder not only of the importance of capturing Pennsylvania voters in this election, but the importance in ultimately uniting in mission. This election has exposed how fundamentally divisive American politics have become, but this message of unity will matter perhaps even more starting on November 9.